The Wheels on the Bus …..
Why is it that decision makers seem to ignore messages from research and service users about what makes services more effective and more accessible? I’ve lost count of the number of research findings confirming that transport is a critical factor in getting people and services together. How could it be otherwise? Services are in one place, people are in lots of other places. Transport is what brings them together. At the North Berwick Day Centre, our Members travel from far and wide. 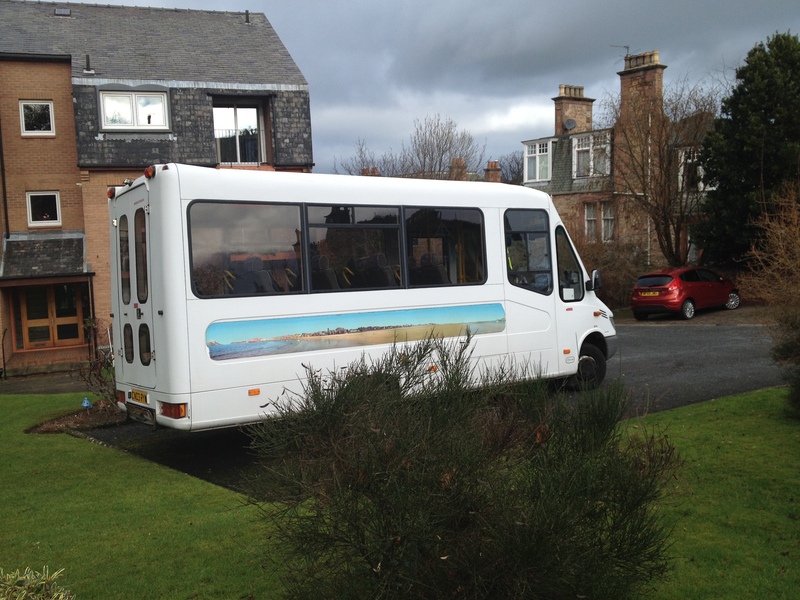 Some Members travel on the Day Centre Bus; some via our Volunteer Car Scheme. Some Members walk and some drive. We’re very lucky in North Berwick to have a range of options which help people get door-to-door safe and sound so they can meet their friends and be part of a wider community. And they don’t sit in the Day Centre all day – Members go for walks round the town, have day trips and generally have a really good time with their friends. Active, stimulated, supported and connected in a very practical and real way to their community. Older people across East Lothian (and beyond) often need help with transport. People, whether they live independently, attend Day Centres or live in Care and Nursing Homes, rely on a range of transport to stay connected to their communities, to live independently. Buses, trains, taxis, Volunteer Car Schemes, Royal Voluntary Service, friends, family and neighbours all help our older frailer citizens get out and about and get on with their lives. And yet it’s really hard to get funding for community transport. Why is transport seen as separate to the services and amenities we provide? Taking services into people’s homes is not transport free – there’s a lot of miles covered by carers and others. But somehow those miles don’t seem to count, they get hidden in the overall costs. Whilst it’s fine for some services to be provided in our own home, helping people get out and about and access local services in their towns and villages brings opportunities for friendship, chats and being part of something. It’s simple pleasures – popping into the shops, going to the drop in coffee in the Day Centre or classes in the Community Centre; shaking a wicked hoof at the Tea Dance or winning the Tomboloa in a Coffee Morning in the Hope Rooms. It’s not good enough just to take services to people, there are lots of advantages all round of taking people to services. Our local businesses also benefit. What’s brought it to mind is the launch of our fund raising campaign for a new Bus. The North Berwick Day Centre Bus is on its last legs after giving fine service for many years. It’ll cost £60,000 to get a new one with all the equipment it needs to help our Members get on and off the bus and travel safely. 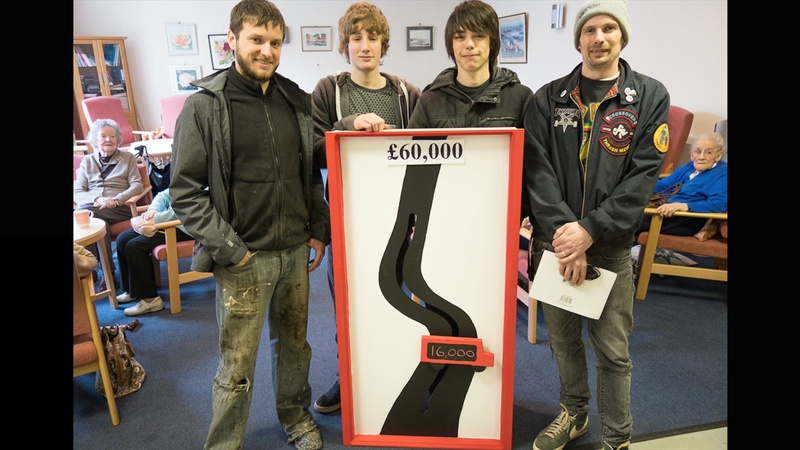 It’s a lot to raise but we were cheered by the arrival of our Bus-ometer courtesy of local young people working at the Space. Here they are proudly displaying their work. Thanks lads! We have to get better at making sure that transport and services are linked better. We will work hard to raise the money for our new Bus, but that time and energy could have gone on all sorts of activities for our Members and of course not every community will have the resources to do what we’re doing. Any brilliant ideas most welcome.